One of the things I've noticed I'm getting better at is being on the lookout for various photo opportunities. Last year I wouldn't have given this a second thought, but as I'm always looking out for new stuff, I thought it was amusing. I went to the dojo Monday night, and parked in the back as I always do. 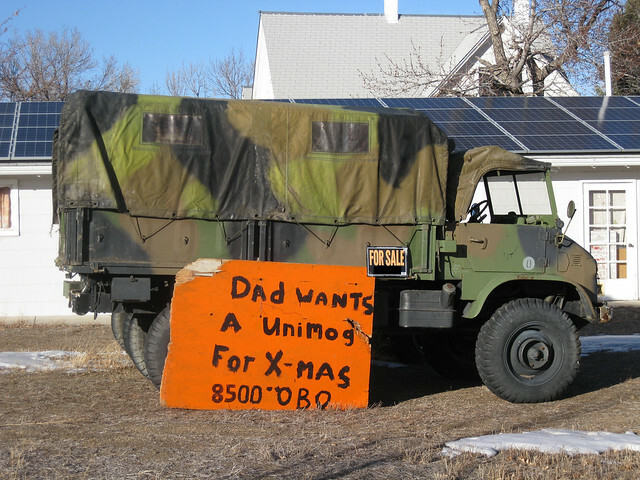 Getting out of my car, I noticed the house across the street had a military truck parked in its front yard with a sign. I wasn't close enough to read the sign, but tossed my camera in my bag yesterday so I could snag a photo of this. I think this is the first time I've actually seen a military truck for sale at all, and definitely the first time I've seen one for sale at some random guy's house. On another note, the same guy has a really old clunker car in his yard. I'm trying to figure out how to get some HDR brackets of it without him yelling at me. I suppose that'll just have to be one of those things I can't photograph.